Robert Moffat (1795-1883) was a Scottish pioneer missionary to South Africa who arrived in Cape Town in 1817. He opened mission stations in the interior, translated the Bible into the language of the Bechuanas, and wrote two missionary books on South Africa: Missionary Labours and Scenes in South Africa and Rivers of Water in a Dry Place. His oldest daughter Mary, married David Livingstone. Robert Moffat. The King's Gardener in Africa. Robert Moffat. Short biography and chronology. Robert Moffat, 1795-1883. Short biography. 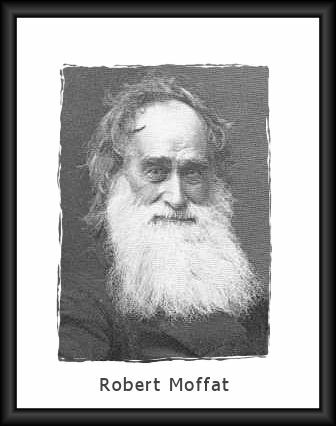 Robert Moffat, Pioneer Missionary. Short biography. Robert Moffat and the Bechuanas. Robert Moffat, the Scotchman Who Went to the Hottentots. Dr. Robert Moffat. Short biography. Robert and Mary Moffat, Missionaries to South Africa. Short biography. Robert and Mary Moffat. Short biography. Robert Moffat: A Case of Parental Objection. Robert Moffat. Chronology of life. Robert Moffat. Short biography for young people. 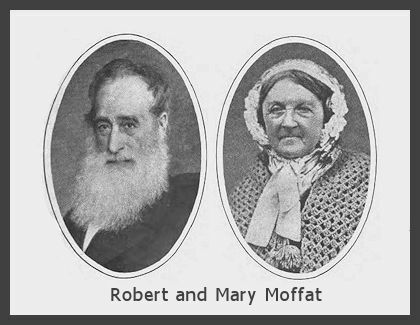 Pioneer Missionaries: Robert and Mary Moffat. Short biography for young people. Missionary Heroes: Robert Moffat. For boys and girls. Portrait of Robert and Mary Moffat. eBooks about Robert and Mary Moffat. Mary Smith Moffat (1795-1871) was missionary wife of Robert Moffat, and mother of Mary, the wife of David Livingstone. Born in New Windsor, England, she married Robert Moffat in December, 1819 at Cape Town, South Africa. They settled at Kuruman in Bechuanaland and established a mission there. They had ten children: Mary (who married David Livingstone), Ann, Robert (died as an infant), Robert, Helen, Elizabeth (died as an infant), James, John, Elizabeth, and Jean. The Moffats returned to England in 1839 for their only furlough. In 1870, the aged missionaries returned to England to stay after laboring together for over 50 years. Mary died shortly thereafter.